The long time exposure image above shows the north circumpolar stars as observed from in Alentejo, about 125 mi (200 km) from Lisbon, Portugal on the night of July 1, 2011. It's a combination of 420 images, each one exposed for 30 seconds, with a total integration of nearly 4 hours -- from 12:53 a.m. to 4:41 a.m. local time. The brighter the star trail the less the magnitude of the star (greater the brightness). Different colors indicate relative star temperatures. Included here are stars that make up the constellations of Ursa Major, Ursa Minor, Canes Venatici, Draco, Cepheus, Camelopardalis, and Cassiopeia. 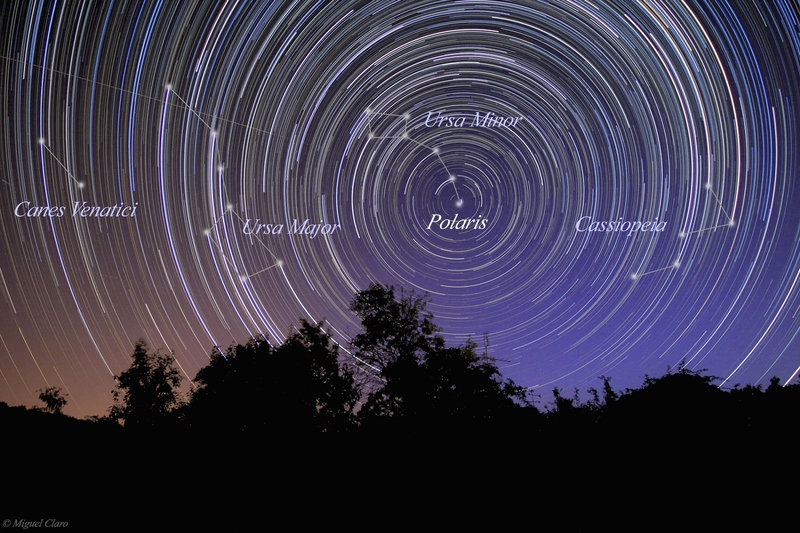 The star at center with the shortest trail is Polaris -- the North Star. Click here to see a annotated image.